Failte Bed and Breakfast can be found close to the beach and Ayr town centre making it a great base for holidays and weekend breaks. Ayr town centre is only a 15 minute walk. .
You probably won't be aware but 'Fáilte' means 'welcome' in Irish, which is great because Fáilte is a friendly and inviting guest house than makes you their number one priority for the duration of your stay. Situated on the west coast of Scotland in the heart of Robert Burns country, this dashing looking property boasts mature, landscaped gardens to the front and rear and has been run successfully by Jennifer Thomson for several years now. This privately owned Bed and Breakfast was awarded a three-star status by the Scottish Tourist Board and is well known for it's good food. 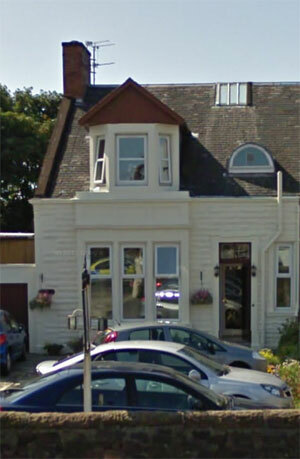 The b&b sits just minutes away from Ayr seafront and is virtually opposite the train station. Ayr Racecourse is also just a 10 minute walk away. Fáilte also offers a pick-up and drop-off service from Prestwick Airport and Ayr Railway Station by special arrangement. Prestwick International Airport and Ayr Railway Station are only several minutes drive away. Call 01292 265282 for more details.